This was originally posted on August 11, 2012 but I’ve updated it a bit and also added new photography. Enjoy! I have yet to find anything that isn’t better with bacon. I’m not saying it’s not out there but it’s seeming doubtful. I tried testing the theory by making ice cream with bacon in it and let’s just say that the theory still deliciously stands. Ben & Jerry’s – take note. See I have this rad cold smoker. It’s the equivalent of a party trick for food. A real crowd pleaser. So I’m always looking for unsuspecting things to smoke and trot out for friends. While lost in a smokey daydream one day, the idea to smoke cream came to mind. Yeah… smoke the cream and then make ice cream out of it! Now I’m on to something. And what would go great with smoked cream ice cream? I’m guessing you can see where this is going. 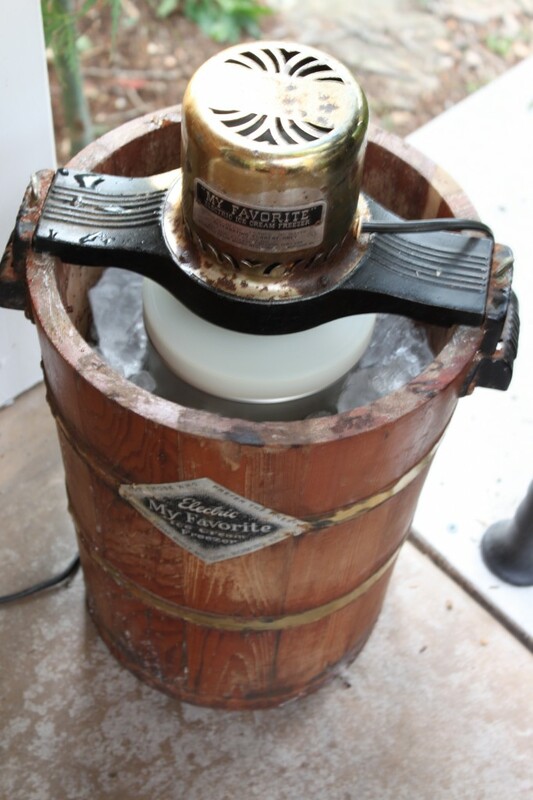 If you have your favorite vanilla ice cream recipe, then get to it. Otherwise I like this version, adapted from Mark Bittman’s How to Cook Everything cookbook (a must have reference book by the way). Combine the smoked cream and ¼ cup sugar in a small saucepan. Heat, stirring occasionally, until steam arises from the milk. Remove from the heat. Using an electric mixer, beat ¼ cup sugar with the egg yolks until the mixture is light yellow and thick, about four minutes. Beat ½ cup hot cream into the egg mixture, then gradually stir this mixture into the saucepan with the remaining cream. Cook over medium-low heat, stirring almost constantly, until the mixture reaches 175° to 180° degrees or is slightly thickened. Do not boil or you’ll have scrambled eggs and while they’re good with bacon too, they’re really nothing like ice cream. There will be a thick coating on the back of a spoon that will hold the outline of your finger after you pass it through. Stir in the remaining milk and vanilla extract. Chill to 40°. If you’re the impatient type you can speed this up by setting the bowl in a large bowl filled with a mixture of ice and water and give it a stir every now and then. Churn chilled mixture in an ice cream maker according to the manufacturer’s directions. Meanwhile make the stir ins. This is so simple it’s almost silly. Mix brown sugar and cinnamon on a plate and then coat each slice of bacon with the mixture. Cover the bottom of a rimmed baking pan with foil (you’ll be glad you did when it comes to clean up) and place a cooling rack on top of that. Spray with non-stick cooking spray and place the coated bacon strips on top. Bake 15 to 20 minutes until bacon begins to caramelized and crisp up, watching carefully as there’s a fine line between done and the sugar starting to burn. Cool, cut into pieces and try not to eat all of it before the ice cream is done. For the pecans, I melted butter in a skillet and mixed in brown sugar. Tossed that with some pecans and let cool on parchment paper in a single layer. Chop coarsely. When the ice cream maker has done it’s job, move the ice cream to a storage container and then place in the freezer to harden up. 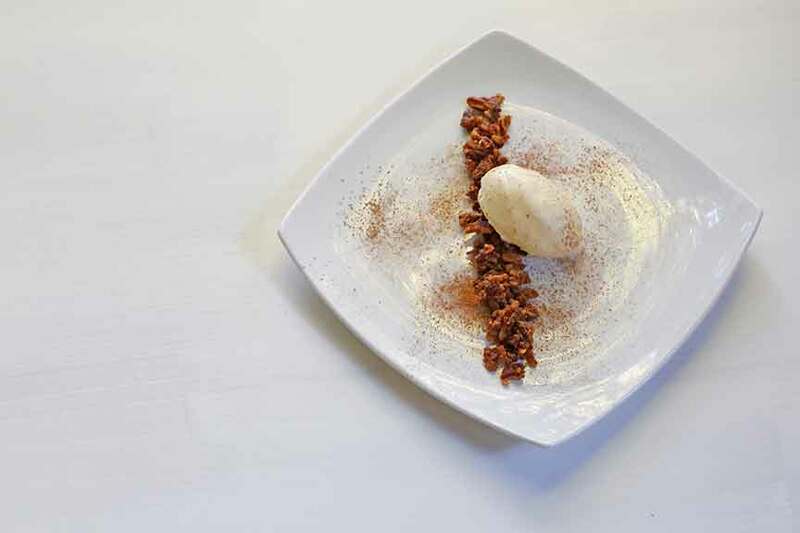 To serve, I started with plates that had been in the freezer. Place the chopped pecans and bacon on the plate. Top with a scoop of the ice cream. 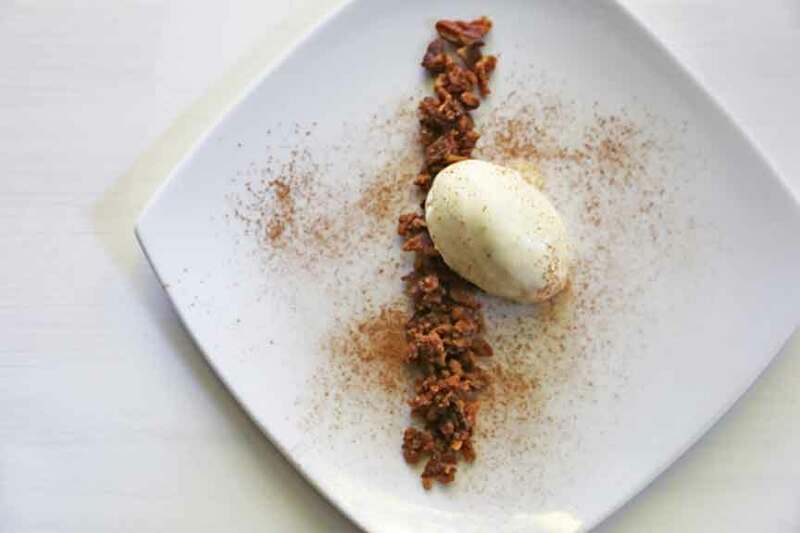 If you really want to be fancy, quenelle it. Top with a dusting of cocoa powder. Break out the spoons and get ready to rake in the compliments. Yup… definitely another thing that is better with bacon.